Every now and then I like to deviate from homewares and design to focus on other things that are close to my heart. A blogging friend recently launched her brand new ebook and I was thrilled to be asked if I would like to review it. 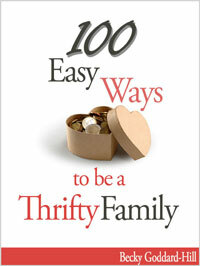 100 Easy Ways to be a Thrifty Family by Becky Goddard-Hill pretty much does what it says on the cover. Through various different chapters, Becky shares hints, tips and advice on how you can adapt your life to save your pennies. It’s concise, to the point and full of easy to achieve ideas. For example, the book takes you through how to feel good on a budget, how to live well, and how to maintain a decent quality of life even when you are budgeting. Yes, there are practical sections that focus on where to go to get help and advice if you’re in debt, who to turn to and who to avoid, as well as more general topics on looking after yourself and those around you. I love the Special Occasions chapter. Christmas, Easter and Birthdays can put a huge strain on a family budget but the creative advice in this section is uplifting, positive and warms the heart! In fact, that’s the general theme throughout the book. This isn’t a depressing book that demands you don’t go out or enjoy your life whilst saving, it’s a book that shares inspirational ideas, personal family anecdotes and a hopefulness that life can be good even when you live frugally. It encourages you to be different, to look on the bright side and take a positive slant on life. Don’t worry that money is tight, look at how you can create family memories and special moments without worrying how you will afford to live. Be sensible, be practical, and be mindful of saving money but don’t feel that life has to be dull or boring. It’s all about a mindset, about an attitude and outlook that will inspire others and certainly give your children a great start in life with money. The book is an easy read, one that you can dip in and out of, or like me, read in one sitting. It’s probably more suited to those families who need some general advice on budgeting and living frugally rather than those who are faced with a lot of debt. Becky Goddard-Hill writes 2 award nominated blogs, Family Budgeting and Baby Budgeting and is a published author of How to Afford Time off with your Baby. Disclosure: I was given a copy of the ebook for the purposes of this review. The comments and opinions however are genuine and honest.